On average, the stock returns for companies who are featured on Fortune's Best Companies to Work List outperformed those not on the list by almost double. Almost double! The list was started 14 years ago by Robert Levering who defines a great place work as "One where employees trust the people they work for, have pride in what they do, and enjoy the people they work with." Growing up in the corporate world, the party line for the company do anything was to "increase the return on the stockholders investment". What that phrase usually implied was that to grow profits we needed to do it at the expense of the Customer, the Employees and sometimes both. And although many companies are starting to come around to the notion that this approach is based upon a shakey premise -- and are starting to see that there is a strong correlation between a great Employee experience, a great Customer experience and higher profits - many are still locked into this outdated mindset. So is it a surprise to learn from Gallup's State of the American Workplace that 7 out of 10 employees are actively unengaged in their work -- costing America $550 billon a year in lost productivity? 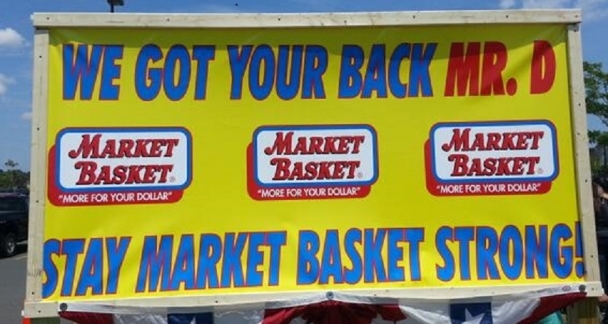 Clearly the folks working at Market Basket are actively engaged - so much so they are willing to walk off the job to make a statement about who they think should be running 'their' company. Check out a video segment created by CBS This Morning that brings all of these statistics to life. It's seems that trust is a major component of Employee and Customer loyalty. Is your company trustworthy? As an Employee, will they have your back when you need to take off work to care for an ailing Mother? As a Customer, will they happily accept a return for a defective product to your store? Come learn how to build that trust and turn your Employees and your Customers into loyal, loving fans. Participate in a leading-edge discussion, with others who share the same passion for great performance as you, at a workshop on September 19th where we will learn loyalty lessons inspired by Tom Burgoyne, the man who has inspired the love of millions as the Phillie Phanatic's 'Best Friend' for the past 26 years. The workshop is being held in the Executive Dining Room at Citizens Bank Park. We promise the take-home pay will be well worth your $550 investment.